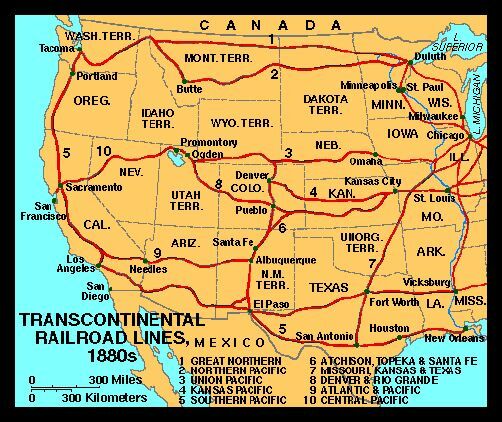 The transcontinental railway was completed with a jubilant celebration on May 10, 1869, when the rails connecting the Central Pacific and Union Pacific Railroads were joined at Promontory, Utah. The locomotive was not an invention of the Gilded Age. Indeed Americans had traveled by rail in the decades that preceded the Civil War. But such travel was risky. 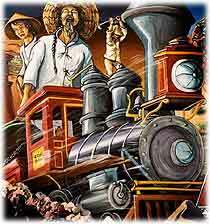 This mural in El Paso County, TX, honors the thousands of Chinese workers who helped build the Southern Pacific Railroad and other transcontinental railroad systems. Passengers often sat in the same room as a wood burner and had to be watchful of wayward sparks landing on their clothing. Braking systems were not always trustworthy. Several engines even exploded while trying to reach a destination. Traveling also represented a tremendous investment in time. Rail passengers often had to change trains frequently because the width between tracks varied from company to company. Such a journey could be uncomfortable, boring, and dangerous. After the Civil War many rail problems were solved. George Westinghouse invented the air brake and trains could stop more reliably as a result. Railroad firms agreed on a standard width between tracks to reduce transfers. The Pullman Car Company produced sleeper cars and dining cars to make travel more comfortable. Soon after the railroad made its appearance in the U.S. in the 1830s, Americans dreamed of linking the Atlantic and Pacific Oceans by rail. A transcontinental railroad would allow for settlement of the west, open new markets for eastern manufacturers, and bring relief to overcrowded eastern cities. Some even believed that it was divinely intended that Americans should control the whole of the continental U.S. In 1845, a Democratic journalist named John L. O'Sullivan coined the phrase "manifest destiny." Steaming locomotives would hasten western settlement, spread democratic values, and increase the size of the United States (Arizona, Oklahoma, New Mexico etc., were not yet states, only territories). Western settlement was a paramount national interest. As such, the federal government awarded the contract to link the coasts by rail to two companies, the Union Pacific and the Central Pacific. 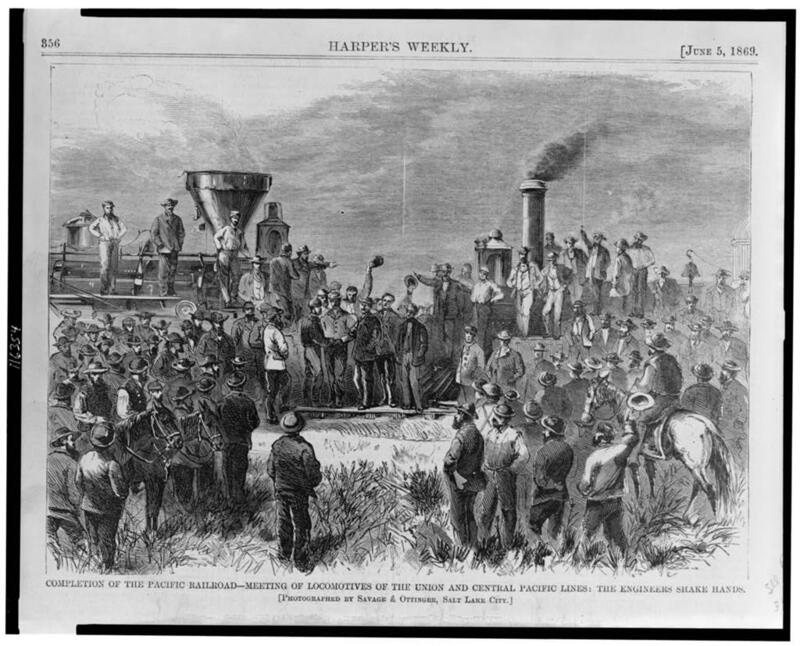 Union Pacific workers, many of whom were Irish and Chinese immigrants, started at Omaha, Nebraska, and hammered their way westward. From Sacramento, California, the Central Pacific made its way eastward with the assistance of thousands of Chinese immigrants. Those working on the railroad gave their sweat and sometimes their lives blasting through the often unforgiving terrain. Other dangers that workers faced were disease, searing summer heat, freezing temperatures in the mountains, Native American raids and the lawlessness and violence of pioneer towns. The government declared that the two lines would merge at Promontory Summit near Ogden, Utah. 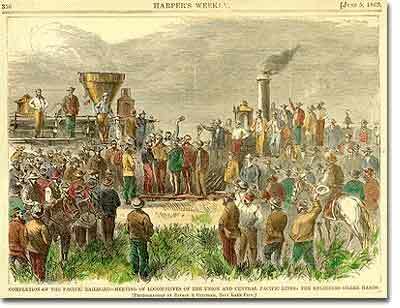 On May 10, 1869, Leland Stanford, representing the Central Pacific Railroad, was provided the honor to hammer a golden spike into the ground that marked the completion of the coast-to-coast line. Celebrations erupted across the land. Even the Liberty Bell tolled once again to commemorate the occasion. Soon, other transcontinental lines were constructed and travel across the continent became worlds simpler, less expensive, and much faster, than by the old Conestoga wagon. The engineering achievement was monumental. The costs of the operation to railroads were enormous. Tens of thousands of workers had to be paid, sheltered, and fed. Tons of steel and wood were required. However, the economic incentives to railroads were enormus. The government offered generous loans to companies who were willing to assume the risk. The greatest reward was land. For each mile of track laid by the Central and Union Pacific Railroads, the companies received 640 acres of public land. In other rail projects, state governments often kicked in additional acres for a growing number of rail companies. 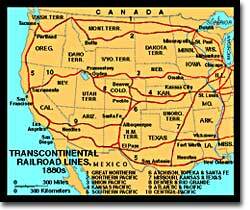 All in all, the railroads received nearly 200 million acres of land from the U.S. government for fulfilling contracts. Directors of some railroads made fortunes. Foremost among the railroad tycoons were Cornelius Vanderbilt, James J. Hill, and Jay Gould. But freight railroad abuses grew rampant. Money lined the pockets of greedy public officials who awarded generous terms to the railroads. Railroad companies set their own shipping rates. Sometimes it was more expensive for a small farmer to ship goods to a nearby town than to a faraway city. Because the companies kept their rates secret, one farmer could be charged more than another for the same freight transport. To reduce competition, railroad companies established pools. These were informal arrangements between companies to keep rates above a certain level. Consequently, the public suffered. Finally, in 1887, Congress responded to public outcry by creating the Interstate Commerce Commission to watch over the rail industry. This was the nation's first regulatory agency. Due to inconcise wording in its enabling legislation, the ICC was largely ignored until the early 20th century. But the public also reaped great benefits. Eastern businessmen could now sell their goods to California citizens. As a result of improved transportation all Americans had access to more goods at a cheaper price. The westward movement was greatly accelerated. Those seeking a new start in life could much more easily "go west.". No industrial revolution can occur without a transport web. The nation was now bound together by this enormous network and its citizens were ready to reap the rewards. This website provides a wonderful collection of historic photographs and artwork related to the building of the transcontinental railroad. 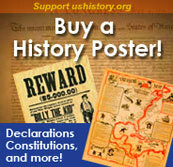 Browse through more than a dozen articles reporting on the event to Americans of the mid-19th century. Great reading and illustrations to match! This look at early railroads from the American Studies program at the University of Virginia includes many images of early railroading, when it was more of a novelty than a useful transport system. Trace the evolution of locomotives and discover just how far today's engineers have come. The building of railroads even affected the way maps were drawn and surveys were conducted. This look at the relationship between maps and railroad is from the Library of Congress and offers many historic maps along with in-depth text. From the links at the top, click on "Land Grants" to learn how speculators distorted maps when advertising railroad lands for sale to the public. President of the Union Pacific railroad, California governor and senator and endower of Stanford University. One of the "big four" visionaries behind the building of the transcontinental railroad. Discover how Stanford built California's Central Pacific railroad with his private funds and political influence. All aboard for a fascinating biography from pbs.org. The U.S. transcontinental railroad was completed when a golden spike was driven at Promontory Summit, Utah, linking East and West on May 10, 1869. Or was it? This site claims not. See why. A brief history of the Interstate Commerce Commission, the first regulatory agency in U.S. history. Learn how an agency intended to protect the public was enfeebled by vague wording in its own enabling legislation. From the folks at Infoplease. Thousands of Chinese workers began immigrating to the western United States in the 1850s. While many industries sorely needed more laborers, some resented the new immigrants and came to blame them for later economic downturns. Economic hardship, prejudice and violence made life difficult for Chinese immigrants. This web page follows their journey and contains a great collection of photographs.